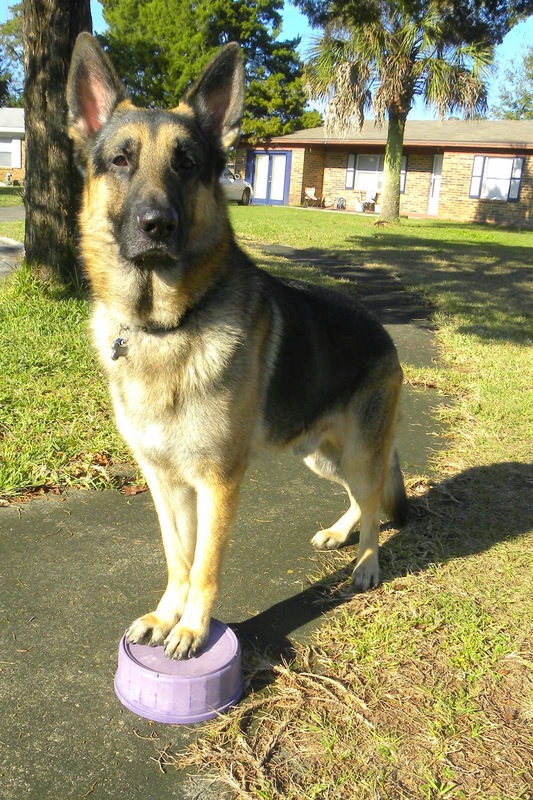 Kelley's Dog Blog: How Do You Train a Tiger? Thanks to my friend for such a great photo. I was too busy gawking to break out the camera. I went to the zoo last month and happened to be at the tiger exhibit when the zookeeper was working with the tigers. I watched intently, and then afterwards asked a hundred questions. (Yes, I am THAT person.) What I discovered is that training a tiger is very similar to (properly) training a dog. How, you ask? First of all, it's all positive reinforcement. The keeper will ask a tiger to do something. If the tiger does what's asked, he gets a treat. If the tiger doesn't, then no treat. There is no forcing, no manipulating, no physical punishment -- because unlike a dog, if you hit a tiger there's a good chance he'll rip your arm off. Hand signals are taught first, followed by a verbal command once the tigers "get it." Tigers are taught to offer different body parts (feet, teeth, belly) for inspection. 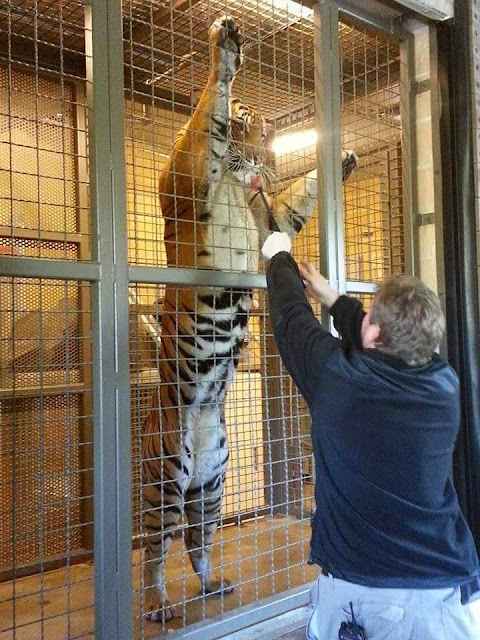 Not only is this good mental stimulation, it develops a rapport between the tigers and their keepers. No, the tigers will never curl up on the couch with their keepers, but a trusting relationship will make it easier to medicate a sick tiger. A marker is used. When training Jedi, I use a clicker to mark a correct behavior. The zookeepers use a whistle, much like the dolphin trainers at Sea World. A cue is given (i.e. "up" in the photo) the tiger performs the behavior, the behavior is marked and then a treat is given. Apparently the tigers picked up on it very quickly. High value treats are used -- in this case, raw meat. If you're going to ask a tiger to do something, you need to make it worth his while. I've discovered this with Jedi as well. The harder the trick, the more valuable the treat needs to be. 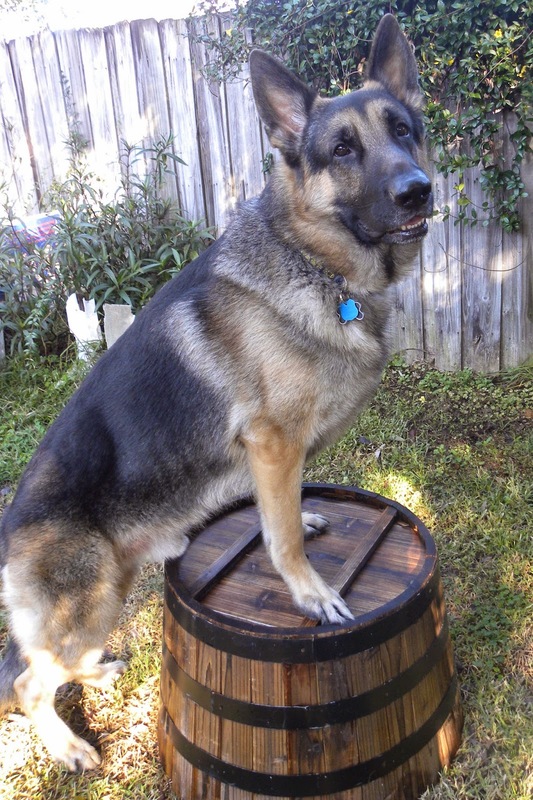 He'll sit and shake (easy tasks) for cheese, but nose work and perch work (more difficult) require hot dogs or chicken. When we're in the show ring (very difficult) he gets steak.